There was one good thing about the week or so I spent on business stuff: My brain seems to have solved the plot problem I was wrestling with before I had to put the writing on hiatus. There was something I wanted to have happen, but it was mutually exclusive with another thing I wanted to have happen. When I was reviewing my notes yesterday, I couldn’t quite decipher what I’d written, mostly why I’d suggested something, and I misinterpreted it, but then the misinterpretation turned out to be the solution to the problem because it put one of the things I wanted to have happen in a different place, which allowed the other thing to happen. Hooray for bad handwriting, cryptic notes, and time away to forget what I originally meant. I suspect that I get more good ideas and solutions out of bad handwriting and cryptic notes than I lose brilliant ideas because I can’t read or understand them later. It’s not so much the original idea that’s so brilliant as it’s the idea that comes after I’ve had a chance to mull it over, and that idea tends to come from attempting to decipher the cryptic notes. Bad handwriting is also a good source of fantasy names. I may have written “Mike,” but it ends up looking like “Melke,” which is a decent fantasy name. It would be fun to write an entire book where all the characters are named based on attempts at deciphering my handwriting. I am so fortunate to live in the day of personal computers. I was watching a documentary on Jane Austen and how she wrote, and I’d be doomed if I had to write and submit my manuscripts in longhand. I have just about all the books republished, though I’m still struggling with a couple of the print versions because they’re not accepting the files, even though they’re the exact same files that they already had. I’ve heard from readers alarmed that the paperbacks were suddenly super expensive, but the new “edition” (exactly the same as the old ones) should be available within a few days, aside from the two I’m wrestling with. So I think I can get back to writing again soon. Whew! This whole thing has been very stressful, but I’ve learned a lot from doing it. Mostly, I’ve learned that I really want a publisher. I’ll finish out the series I have started, but we’ll see about what happens otherwise. If I can’t sell more books to publishers, I guess I’ll have no choice, but it’s so much easier to let someone else handle all this other stuff so I can focus on writing, which is the part I’m good at. I’m still working on updating all the links on my web site, doing it a bit at a time as links come in. But right now, what I really want to do is write, so I may spend a day doing that. The slog of getting my books republished continues. Yesterday was the fun of setting up the print books. There was one that we didn’t have a ready-to-go file for because it was done in the early days when we just had CreateSpace set it up, so I had to format that one myself using a template. It wasn’t too hard once I figured it out, but it was a bit tedious. I made the mistake of working on that at night, so I had dreams and nightmares about formatting books all night long. Today I have to proof it and all the other books that I got set up. Then I should be mostly done with this transition phase and I can get back to writing. I’m almost eager to get back to writing after dealing with all this. Maybe my mind will have solved that pesky plot problem I’ve been wrestling with. I hope it’s been working in the background while I’ve been doing busy work. But I may not force myself to think about it until Monday because it’s a busy weekend. I’ve got a Good Friday service tonight. I’m singing with the choir and I’m also one of the readers — but being a reader means I also have to put out a couple of candles. There is some peril to doing this while wearing a choir robe, but we do have a long-handled candle snuffer. Saturday, I’ll be baking to get ready for the choir’s Easter potluck breakfast, when we get to grab some food between services. We have to sing for three services, which means I’ll be leaving the house around 7 a.m. and getting home around 12:30. I will then promptly collapse for the rest of Sunday. Getting back to my regular swing of things will be a relief. I had a dentist appointment yesterday morning, which somehow managed to throw off my whole schedule for the day, so there was another oops morning of forgetting to post. Meanwhile, I’ve been busy with some business-related stuff. My agent has been handling my independently published books, working almost like a publisher in handling the business side of things, but she’s transitioning away from doing that, so I’ll be handling it all myself in the future. In the long run, it will probably be good because I get the royalties without paying a commission and because it gives me a lot more direct control over my books. In the short run, there are some transition headaches because we have to remove the books from all those sales venues and then I have to repost them myself. At the moment, things are kind of in flux because it takes a little time to get everything up again. I’m updating the links on my web site as I go, but it may still be a week or so before everything is settled. There may be some places where books are no longer available because my agent was able to get access but I can’t on my own, or she was able to get a special deal that I can’t get. For instance, I won’t have books on Google Play anymore because they’re difficult for an individual author to deal with, but I only sold a few copies total there, anyway, so I’m not too worried. I’ll probably only have paperbacks through CreateSpace rather than in the Ingram catalog because Ingram requires a lot of up-front fees. My agent was able to get a deal that cut those down, but I don’t sell enough books there to make their full fees worthwhile. On the other hand, since I’m going with a distributor for everything but Amazon, my books may now be in some new places, where I hope to find some new readers. I’m sure everyone who bothers to read my blog has already got copies of everything, so this probably won’t affect you. There just may be some challenges temporarily if you’re recommending books to others or trying to buy gifts. I’m looking forward to getting back to the writing part of work after spending a few days uploading files and filling out web forms. This is why I want to find a new publisher. I know some people love the business side of things and like having total control over everything. I’d rather just hide in my cave and write and let someone else do all the other stuff. I’m glad to have the option of putting books out myself because it’s kept my career alive and makes me a decent amount of money, but it’s kind of a struggle for me, and even more so now. I guess in the future it won’t be quite so tedious if I’m just doing one book at a time rather than my entire catalog all at once. It’s a nice rainy day, which often means more productivity, unless I give in to the urge to nap or read. I do sometimes consider that a perfect reading day gets turned into a holiday, but I have too much writing to do to get away with that right now. I also have a lot of business-related work that needs to be done. But maybe if I’m very good and productive, I can stop early this afternoon and spend some time enjoying the good reading weather. In the book I’m revising, I’ve hit a point where the smaller changes made earlier in the book have resulted in major changes to the plot, so I’m not really revising anymore. I’m writing totally new material, which means figuring out what happens next and how it’s going to happen. That slows things down a bit. I have to separate myself from what did happen and think of what these characters really would do in these new circumstances. This process starts to feel like one of those “choose your own adventure” books. I’ll think of what could happen next and realize that there are a couple of different paths I could take. I get out a piece of notebook paper and list what could happen with each option, and I choose the version that either makes more sense or that results in a better story (preferably both). If the better story isn’t necessarily the one that makes more sense, I have to come up with a way to make it make sense, and that may require going back to an earlier scene to set it up. For instance, I figured out that I could justify the more exciting option if the characters knew the bad guys were close to finding them, and I came up with a way for that to happen, but for that to work, the characters have to be able to recognize a person that they hadn’t previously met, so I had to go back a few scenes to set up how they would recognize him. This is going to require a lot of tea. And chocolate. I spent Saturday at a local writing conference-type event. I mostly went to force myself out of the house and because I wanted the company of other writers, but I ended up getting something out of the sessions. One of them really had me thinking about ideas for marketing. It was about creating/encouraging a “fandom” around your books. You look at the kind of activity that happens around big franchises like Harry Potter or Star Wars — there’s fan fiction and fan art, fans form groups to interact and discuss these things, they dress up as characters for conventions, they make or buy props or other items to wear or carry, there’s merchandise, they make fan websites, etc. What can you do during the process of creation to make it easy for these kinds of things to happen? For instance, concrete descriptions of characters, their clothing, or items they use can make it easier for people to create art or put together costumes. Having some symbol gives people something to wear (or even get as a tattoo) to show their fandom. Then there’s stuff around marketing, like priming the pump with memes, images, or videos that can be shared by fans. And then there’s using your own fandom for other things as a way of reaching out to potential fans of your stuff. If you like a thing, then other people who like that thing may like what you create. I’ve kind of been doing some of these things. 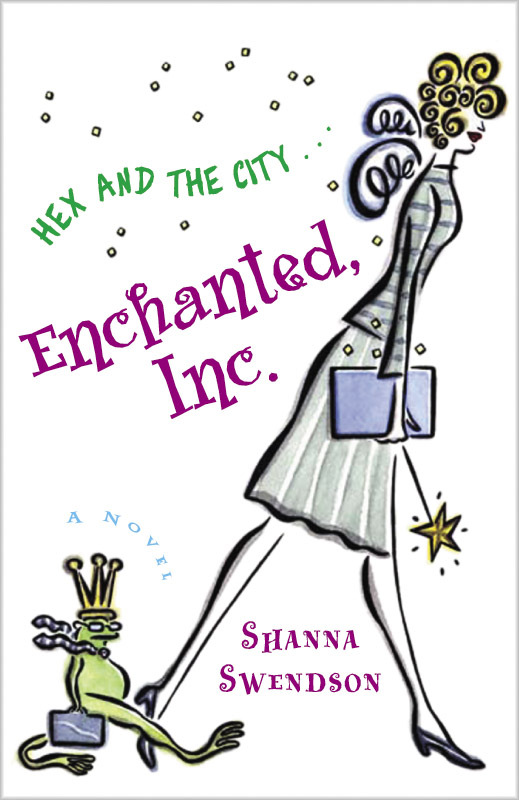 When the Enchanted, Inc. series first launched, I initially pitched it as “Bridget Jones meets Harry Potter,” and a Harry Potter book came out a couple of months after the first book in my series. I tried to sell my publisher’s publicist on trying to create some trend stories around that, but she was reluctant. She wanted the stories to be about my book, even though that was highly unlikely. I did an end run around that and the name I gave her for the local newspaper wasn’t the books reporter, but rather the one I’d noticed was covering Harry Potter. Sure enough, my book ended up in an article about what moms could read while waiting for their kids to finish reading the new Harry Potter book. I also sent copies to people who ran Harry Potter fan sites that had lists of other books fans might enjoy. I wrote blog posts about the Harry Potter books and movies. Most of this was in the days before social media was really a thing, so it was probably a bit harder to get traction. Those books do seem to have something of a fandom. There’s fan fiction. I don’t know about art, discussion groups, or people dressing up at conventions, but then there’s not really anything to dress up as, since it’s contemporary, unless someone did something like put fairy wings on a business suit. With the Rebels series, I hoped from the start that the Rebel Mechanics emblem would become a thing, with people incorporating the gear on a red ribbon into steampunk costumes. I have had readers give me emblems they’ve made, but even though I distributed a lot of gear and ribbon pins at conventions, I haven’t really seen people wearing them. I haven’t noticed it becoming a thing. But I do have some ideas for things I might be able to do. Now I guess I need to create a comprehensive marketing plan and then actually execute it. Oops, I totally forgot to post yesterday. I slept a bit late (well, more thinking than sleeping, but still, stayed in bed a long time), then went to the library, then got home and got sidetracked on the day’s to-do list and didn’t realize until late in the day when I got an e-mail about needing to approve comments (all spam) that I hadn’t done a blog post. I guess I didn’t have anything I was dying to say. My brain has been on creative overdrive lately, and thus the lying in bed and thinking in the morning. I keep getting story ideas in dreams, and when I wake up, I have to rerun and ponder everything I remember from the dreams so I don’t forget them. Last week, I dreamed a title — in the dream, I saw a book and was immediately insanely jealous that someone else came up with such a great title and story idea because I really wanted to write that story. I still remembered that title when I woke up and a bit about what the story was about. It wasn’t quite as brilliant as I thought it was in the dream, but it was still a potentially fun idea. I searched that title on Amazon and on Google, and it doesn’t seem as though anyone else has used it, so that’s one for the idea file. This week, I had a rather vivid dream that was essentially a story — something about smuggling babies for a resistance movement as a way of helping their parents escape (infants aren’t conducive to stealthy escapes, so the parents had a better chance of getting away if someone else took their babies). The more I thought about it, the more I started to think there was a story there. Then last night, I had a more fleshed-out version of the same dream, with more details, even bits of narrative (it’s possible there was some semi-conscious brainstorming also going on, weaving in and out of the dream). I think I captured it all upon waking, but I really need to write it all down. The thing is, creativity breeds creativity. That’s why writers are more likely to have more ideas than they can ever get around to writing than they are to run out of ideas. About midway through any book, you’re just about guaranteed to get a brilliant idea for something else. The more you write, think, and create, the more ideas you’ll have. You also start training your brain to find ideas. You’ll see ideas in anything you read, watch, or experience. It may be something totally out of the blue, like smuggling babies, or it may be what ifs based on something you’ve seen, going a different way with someone else’s plot or character until it becomes your own thing. And, eventually, you learn which if these ideas are likely to be viable and how to develop them into something you can actually write. Fall is my favorite time of year, but I’m developing an appreciation for spring, as well. I’m enjoying seeing the trees leafing out and the flowers blooming. I like weather that’s warm enough, but not too warm, for being outside while the nights are still cool enough for comfortable sleep. Now, if only we could do something about that wind. The change in seasons brings with it a change of habits, but it’s a transitional time, so both habits might apply at the same time, or neither might apply. This came up in a conversation I had with the checker at the grocery store the other day. The winter fruits and vegetables that I had been buying for the past few months didn’t look so good, and summer fruits and vegetables were starting to be on sale. I’d had to mentally adjust my menu plans and shopping. Meanwhile, I’d had to give up making homemade yogurt during the winter because it was too cool at night to maintain the necessary temperature without more specialized equipment, and it was hard (or expensive) to get the berries to eat with it, but I got into bread baking, so my standard breakfast became homemade fruit and nut bread instead of yogurt and fruit. Now berries are coming back (without having to be imported from Chile), and it may soon be warm enough for yogurt, while being too warm to bake bread. At this time of year, I start waking up earlier and getting sleepy earlier, so my schedule shifts. I do more walking (when it’s not so windy that it blows me off my feet). I’m even a bit more social (I went to a party this weekend and a get-together with the church women’s group on Monday night). The down side is that during this time of transition, I tend to get restless and unsettled, and that makes it hard to focus on writing. I really ought to take a look at my productivity throughout the year and graph it, and then if I ever feel like I’m caught up or am in a position to plan my working schedule, I can plan to write during certain times of the year and focus on other things during the times that are less productive. But I’m not there yet and I have a book to finish, so I guess I can’t indulge in spring fever this year. In spite of having discovered the wealth of video programming on Amazon Prime, with so many wonderful documentaries, I’ve been in a heavy reading mode lately, which is wonderful. I think one of my recent reads is something fans of Rebel Mechanics would enjoy: The Strange Case of the Alchemist’s Daughter by Theodora Goss. It’s not actually “steampunk” but is set in the Victorian era and does get into retrofuturistic science, and it does involve brainy and plucky young women trying to find their place in the world and dealing with a secret society, so there’s a lot of thematic crossover. I’d read most of the books being referenced, but now I need to go back and read some of the others, just so I can be certain of getting all the references and jokes. So, if you like things like Rebel Mechanics or Victorian adventure fiction, in general, or smart women with superpowers, this is one to look for. This is going to be a busy couple of weeks for me. I’ve got a proposal to finish and send to my agent, I’ve told myself I’m going to finish the current draft of the current book by the end of the month, and I’ve got a meeting tonight, a conference this weekend, and next week is Holy Week, which is busy when you’re in the choir. Of course, this is when I suddenly want to clean and redecorate my house. Someone on Twitter joked about starting a service that schedules procrastinating writers to come clean your house, but I’m not sure that would work because it’s only my house I care about cleaning. I tell myself I’ll be so much more productive in a more ordered environment, so really I’m helping myself meet my deadline if I take a day or two off from writing to clean and organize. I usually push through it and make myself write, telling myself that when the book is done I’ll have an epic cleaning day, but when the book is done, I collapse on the sofa with either a book or the TV. I’ve also learned that I fizzle out when I try to do a whole day of cleaning. I do better with a few defined tasks for the day, spread out over a few days. So, maybe when the book is done I’ll take a couple of days “off,” with cleaning mixed in with relaxing. I do think the book is close to being done. I’m more than halfway to my target word count, and I like what I’ve done so far. The rest of the book is going to veer widely from the initial draft, which is good because that didn’t work. But it does mean I’m in original writing mode without being able to draw a lot from the first draft. It may be time to break out the Word Count M&Ms. First, though, that proposal, which also underwent a dramatic change between drafts.